Are you wondering how to check your tire pressure because you’re trying to avoid getting a flat? That’s probably the most important reason to do it, but, in fact, there are lots of other benefits. If you do it right, you’ll increase your vehicle’s lifespan, ensure a quicker steering response, and achieve greater fuel efficiency and a smoother ride. Luckily, checking and refilling your tire pressure is uncomplicated and inexpensive. Canadian tire and other auto parts stores carry both items. You can even buy portable air compressors that run from your car battery or 12V power port. Alternatively, most gas stations have an air compressor with built in pressure gauges that costs just a loonie or two to operate. Now that you know what you need and why you need to do it, let’s dive into the five easy steps of checking your tire pressure. P.S. Before we begin, PSI stands for “pounds per square inch” of pressure. It’s based on your vehicle’s total weight and size, towing weight capability, and recommended tire size. To have all other confusing jargon explained, check out this article. If possible, it’s best to check your tire pressure when your tires are cold for the most accurate reading. Your tires will be “cold” if your vehicle has been parked for three or more hours. The reason why it’s best to measure your tire pressure when your tires are cold is that the recommended PSI specified in your owner’s manual assumes your tires are cold. As you drive, your tires heat up and the air inside expands, throwing off the PSI reading. You can typically find this information on the driver’s side door jamb or in your trusty owner’s manual. The recommended PSI will likely be different for front and rear tires, so be sure to read carefully for the correct information. Fun fact: the manufacturer’s PSI recommendations may not amount to optimal tire performance. For regular, every day driving, the recommended PSI is a good benchmark to follow. However, if you happen to hauling a heavy load in your trunk, you should consider exceeding the recommended PSI by a slim margin in the rear tires, as those extra few pounds of pressure will help your car handle the extra weight. Just remember to release the air pressure to come back to the standard specifications when the weight is unloaded. Oh, and if someone has ever told you to go over the recommended PSI because increase your vehicle’s fuel efficiency, ignore that person’s advice in the future. While you may save a few dollars on gas, the trade-off is that your vehicles handling will worsen, your tires will more easily blowout, and your tires’ treads will wear unevenly and at a quicker pace, ultimately costing you more money in the long run. One tire at a time, remove the tire’s cap, then place the gauge on the valve stem and press down hard. If you hear a hissing sound, that means you aren’t pressing down hard enough. Press past the hissing sound until your gauge provides a reading. In order to avoid any mistakes or misreads, check the PSI two to three times and go with the reading that comes up most often. This should only take you a few seconds per tire. Once you’re finished, screw the caps back on and voila, you’re tire pressure is all checked out and you’re ready to roll. Unless the PSI you were reading doesn’t match up with the recommendation, in which case continue reading to find out what to if you’re PSI is too high or too low. 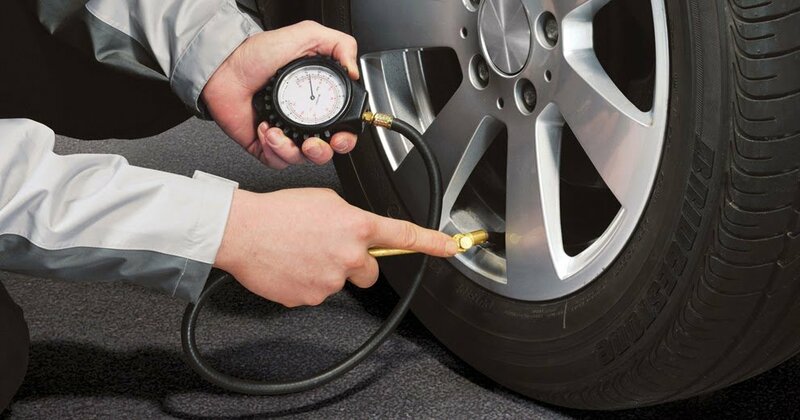 If you’re tire pressure gauge is showing you that your tire pressure is too low, use an air compressor to refill those tires with low air pressure. There are various kinds of air compressors, and while most of them are quite similar, you should still make a habit of reading the instructions to make you sure you’re doing it right. If, like most people, you’re using the gas station’s air compressor, be sure to park your vehicle close to the hose so that it can reach all your tires. Since you’re checking your tire pressure at the gas station, it stands to reason that your tires aren’t cold. In which case, it’s okay to fill your tires a few PSI units above the recommended level, as they’ll level out as they cool down. But for caution’s sake, check again when they’re cold to be certain you have it right. Once you’ve turned on the air compressor (you’ll know it’s on when you hear the motor running), press the hose fitting down onto the valve stem and press the lever. You’ll feel air flowing through the hose and hear your tire begin to inflate. By releasing the inflation lever, you’ll be able to intermittently check the tire pressure as it is filled. Once you’ve hit the correct PSI, stop the air flow, remove the hose from the valve stem, and screw the cap back on. If you have the opposite problem and your PSI reading is higher than it should be, simply press the gauge down far enough and air will release from the tire. Do this until your gauge reading matches the recommended PSI level stated in your owner’s manual. Once you’ve hit the right level, screw the caps back on and you’re good to go! For all your tire and automobile related questions, seek out your answers in our blog, or drop a line in our comments section below. Our mission is to solve all your car conundrums! Winter Tires vs All-Seasons: Which Do You Need?